Will we ever have home cinema without any wires? The typical home cinema setup is invariably a rat's nest of speaker wires and component connections, particularly if you have a full-blown multi-channel sound system. If you've just jumped aboard the Dolby Atmos audio bandwagon, your front room could be stuffed with nine speakers or more, complete with wires... and that's without factoring in source components. In short, that's a lot of cable, so it's easy to see why the notion of a wireless home theater has instant appeal. The good news is that the technology to achieve this neat and tidy dream is largely here already – but cost and engineering challenges are the major hurdle to overcome before we can consign wires to the bin - so we're taking a look at what's holding them back. 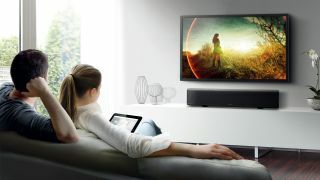 Multiroom systems, including Sonos and Denon's HEOS (to name two of many), have championed the idea of wireless audio. Delivering stereo around the home over Wi-Fi is now relatively affordable. For Sonos users there's even a wireless 5.1 surround sound option, built around the Sonos Playbar. For home cinema users in general, audio is already primarily wireless. High-quality music streams from Spotify, Tidal and internet radio count as standard sources, so much so that they are often built directly into hardware if not streamed from a mobile device. Bluetooth, particularly with aptX, is a great way to get music wirelessly from a smartphone to a home theatre system. If your AV receiver doesn't have native Bluetooth support, then Arcam's MiniBlink (£99 / US$150 / AU $249) is one of the better ways to upgrade it. This pebble-shaped receiver DAC converts a Bluetooth stream into a high quality line-level audio source. Another increasingly compelling way to deliver sound and vision wirelessly to your AV system is by using Google Cast. Any Google Cast-enabled app or content can be streamed to a ChromeCast dongle (£30 / US$35 / AU$38) connected to your home cinema system. Just plug your ChromeCast gadget into one of your AV receiver's HDMI inputs and you'll instantly be able to start streaming music around the home. Connecting Blu-ray players and TV set-top boxes wirelessly, however, presents more of a challenge. Wireless video senders enjoyed a bit of a renaissance a couple of years ago, when wireless HDMI models replaced the flaky old Scart RF video senders of yesteryear. They typically used the 5GHz band designated for short-range wireless LAN applications. Some were bolstered by MIMO (Multiple Input Multiple Output) antennas, for improved reliability. Today, buyers might look toward the Optoma WHD200 wireless HDMI system (£199 / US$215 / around AU$882) to achieve the effect. It comprises a transmitter with two HDMI inputs and one local output, and a HDMI receiver, and supports HD and multichannel audio. "Wireless HDMI senders have their limitations though," suggests Rob Sutherland, MD of Inspired Dwelling, a CEDIA (Custom Electric Design and Installation Association) member that specialises in leading-edge home cinema systems. He says wireless video senders are typically limited to distances under 10 metres. "There's also the general issue of latency, where there is a delay in the time it takes for your equipment to process audio and video data." Early attempts to sell wireless HEOS 3 speakers as a stereo pair for TV use were scuppered by this problem when it became clear that audio was being delivered out of sync with the TV picture. Similarly, first-generation Bluetooth headphones proved of little use to gamers, when latency issues made it almost impossible to react to threats. This led to the development of aptX Low Latency (by makers CSR), which improves audio-video sync by reducing latency to -32ms. Broadcast TV is designed to work with a latency of up to -60ms (audio after video), so the tech could easily keep up. Alan Gibb, MD of The Chord Company, a leading UK manufacturer of premium Hi-Fi and video cables, perhaps surprisingly says it's inevitable that all our home entertainment sources will become wireless eventually: "The real question for home cinema enthusiasts has to be what quality can be achieved with the technology?" Currently, audiophiles will always opt for wired over wireless AV, he argues. "Signal conversion to wireless and back again opens audio to potential degradation and interface issues. "Many existing digital systems are very intolerant of HF noise. Well-screened cables help keep this issue at bay allowing higher levels of performance from even very modest equipment." Rob Sutherland suggests current bandwidth limitations preclude wireless high-end home cinema. "When it comes to a Dolby Atmos or 7.1, we may not see a wireless home cinema in the near future, especially not one which delivers a no-compromise AV experience," he cautions. It's currently not possible to reliably deliver 4K video wirelessly. "But there's no doubting the positive aspects of wireless AV," Sutherland adds. "It enables people to build a home cinema without having to tear down their walls and ceilings. It avoids the costs which come with wiring a space for AV. "Despite these benefits, with some wireless AV products, the wireless element is sometimes not actually integrated into the speaker or TV, and consequently, additional black boxes are required to transmit and receive the signal." There's still the issue of reliability to resolve when it comes to wireless signal distribution, notes Sutherland. "Although cabling is not completely immune... wireless systems are often subject to interference from third party devices and even coverage blind spots which will not allow wireless signals to come through the walls, floors or ceiling." There have been developments to improve Wi-Fi reach. Some high-end 802.11ac routers, from brands such as Linksys and D-Link, use targeted beamforming to improve penetration. They need to work with a Wi-Fi device that specifically supports the technology for it to work though. Gibb from The Chord Company is cautious. Wireless transmission still has to contend with variations in building materials in the home, he warns: "For example, in many new-build properties (the UK is targeted to build 250,000 per year), foil-backed insulation materials such as plasterboard, often present unforeseen transfer problems. "Even older buildings with thick stone walls present their own issues. There's also a growing health backlash over the quantity of RF running round a modern living environment. Some European countries have [even] banned Wi-Fi in schools, following guidelines surrounding child health!" When it comes to upgrading standalone components, from Blu-ray players to TV boxes, there's still the sticky issue of cost if you want the premium wireless experience, says Gibb. "Senders and receivers need to be at both the source and sink and not force a significant price premium over wired devices," he says. "The home cinema market is very cost-orientated and at the affordable end, this technology would need to integrate without a significant cost for the end user." But never say never. "At some point this will all be possible," insists Sutherland, "As long as there is an increasing demand for wireless solutions, manufacturers will continue to meet demand. "However, someone will need to solve how to get power to the units within the room to make home cinema a true wireless proposition!"